Get car rental Rennes at low rates by filling in our search form! Enjoy amazing looks and relax at your leisure with our reliable car rental vehicle! Car rental Rennes with Rentalcars24h.com is suitable for all occasions. For example, if you need to go for a business trip to another city, use the services of car rental and start your trip on a comfortable car. Or if you want to relax, rent a car and travel with the whole family, getting all the benefits of our cheap and reliable car hire service. Wherever you are we always find the best car rental deals for you! Decide on the most suitable Rennes car rental location and don’t forget to look through Must Know and Places to Visit with car rental Rennes! 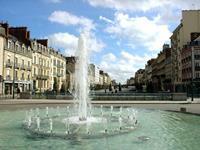 Rennes is the capital of the Brittany region and the prefecture of the Ille-et-Vilane department. It is situated at the meeting point of two rivers – the Ille and the Vilaine. You may fall in love with Rennes at first sight, from the first steps on its snug and charming streets. Generally, Rennes is a wonderful city. It attracts people of different nationalities and ages. Once you have come here – you want to come back to this city again. Mobile phones shouldn’t be used while driving, even with a ‘hands-free’ system. As with non-use of seatbelts, you can be fined on the spot. 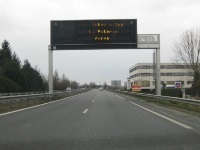 Diamond-shaped yellow signs with a white border, which are posted at regular intervals (e.g. every 5km) on some national roads, indicate that you have priority at all junctions. If this sign has a thick diagonal black line through it, however, it means that you no longer have priority at every junction and must obey individual junction signs. 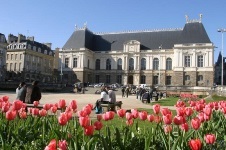 The Palace of the Parliament of Brittany, erected in the first half of the 17th century, is one of the most popular attractions of Rennes. Strict classical style, tile roof, arched towers lofts and spacious interior rooms with rich décor - there is much to admire. Heavily damaged during a fire in 1994, the palace was restored and opened to the public in 1999. 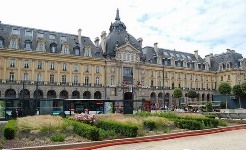 Get car rental Rennes and come to explore the palace. St. Pierr Cathedral is one of the oldest and most spectacular sights in Rennes. The foundation of the cathedral was laid in the XII century, but the construction of the temple took place in the XVI century. The cathedral is built in the Flamboyant Gothic style. Only round rotunda is built in the Renaissance style. It stores the Sacrament, hidden from prying eyes by tapestry depicting the lives of saints in 1615. This is the largest building in Rennes. Built on the bank of the Vilaine river relatively recent – in 1885-1929 it was raised to obscure the smaller buildings behind and give the city a more modern look. It housed the commodities exchange and the postal and telegraph office. Now it's the post office. The Thabor gardens were designed by Denis Bühler on the orchard of one of the oldest abbeys in Rennes in the 19th century. 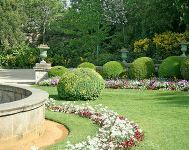 The gardens, which is spread over 10 hectares in the city centre and includes a French-style garden, a picturesque garden with exotic species, fountains, an aviary, a rose garden, statues, greenhouses and a bandstand, are rightly regarded as one of France’s finest. RentalCars24h.com offers you reliable car rental Rennes services that will help you to feel free and independent when moving around the town. Providing best online prices for car hire Rennes services, RentalCars24h.com allows you to save money each time when you rent a car in Rennes.